ElbaMaMaison is a different experience for those who enjoy a holiday in contact with nature in the silence and scents of the Mediterranean. On the South coast of the Island of Elba, overlooking the Gulf of Seccheto, near the beaches of Cavoli and Fetovaia, isolated on a hill, 200 meters from the sea and with a unique view of the Tuscan archipelago, a small dwelling on the particular flavor It surrounded by a lovely garden overlooking the sea. ElbaMaMaison is a unique experience for those who like spending holidays enjoying nature, quietness and perfumes of the mediterranean area. In the South Coast of Elba Island, facing the gulf Seccheto, Cavoli and Fetovaia near the beaches, isolated on a beautiful hill, 200 meters from the sea and with a unique panorama of the tuscan archipelago, to tiny wonderful house, surrounded by a nice garden, facing the sea. Allein stehendes ein, mit viel Liebe eingerichtetes Häuschen am Hang, umgeben von einem hübschen raubendem Atem Garten mit Blick auf die toskanischen Islands, an der Südküste von Elba, oberhalb des Golfes von Seccheto gelegen, 200 m vom Meer entfernt, nicht weit von den Stranden von und Cavoli Fetovaia. Wonderful home away from home with a spectacular view! We really enjoyed our week in this wonderful little house and spent a lot of time on the terraces. The house is fully equipped (all utensils needed in the kitchen are there, beds are made up, plenty of fresh towels in the bathroom, washing machine,...). We found it very clean, well decorated and very welcoming. 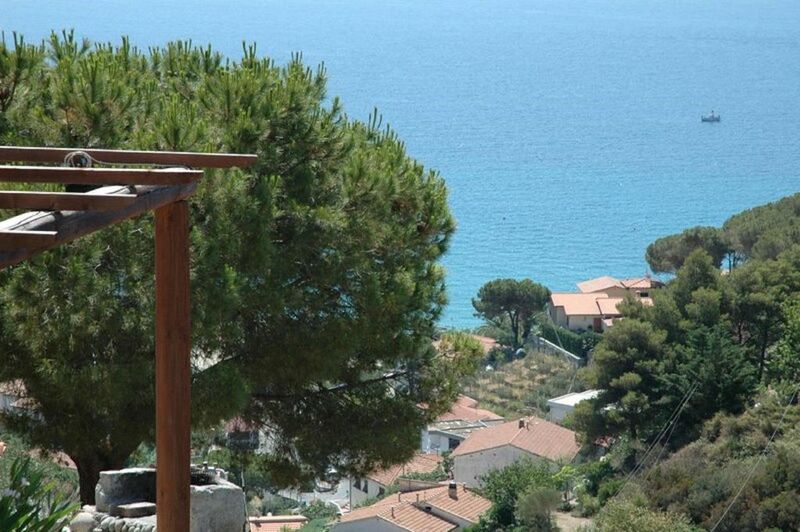 It is situated on top of the mountain, very private, overlooking the bay of Seccheto. You just can't get tired of the view. The house is on a steep hill, very quiet, lounge chairs on the 2 terraces, big dining table outside, barbeque, outdoor shower, shaded parking space for the car. It is a challenge to drive up the hill the first time, but after you have done it once, it gets easy. We went up slowly in first gear all the way and managed quite well. It is definitely worth it. As the terrace on the house is at different levels and not entirely closed, we would not recommend it to families with small children. The owners are wonderful people, nearby but very discrete. Casa in ottima posizione per visitare le spiagge e con una vista sul mare invidiabile. L appartamento pulito ed ordinato; padroni di casa disponibili discreti.